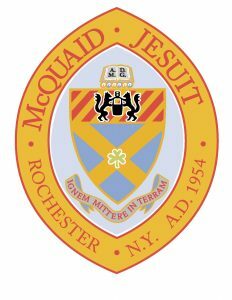 McQuaid Jesuit is a Catholic, Jesuit, college-preparatory school that inspires young men to realize their God-given gifts through the pursuit of excellence in all things, service to others, and a life-long commitment to justice. A Faith that Includes: The message of the Gospel and the life of Saint Ignatius Loyola empower us to find God in all things and in all people. A Life of Learning: The pursuit of excellence, and the development of critical thinking skills lead us to actively engage the complexities of our world. A Spirit of Empathy: Service with and for others fosters a spirit of empathy and a desire for reconciliation and justice. A Call to Leadership: Students are called to be leaders within our school and in their communities, guided by sound conscience and grounded in humility. An Appreciation of Diversity: The diversity of the McQuaid Jesuit experience inspires gratitude in our students and prepares them to excel in a global community.